Prompt: If you have a website, blog or online document – create an “About Me” page or introduction. It should start off by telling people why you’re doing what you’re doing. It should then explain clearly what it is you are doing, and how you will do it. Response: See this page. I’ve broken it down into my why (my backstory), my how (the creative arts), and my what (my academic and artistic ventures). I’m finding it hard to keep it short, though, so suggestions for edits are much appreciated! 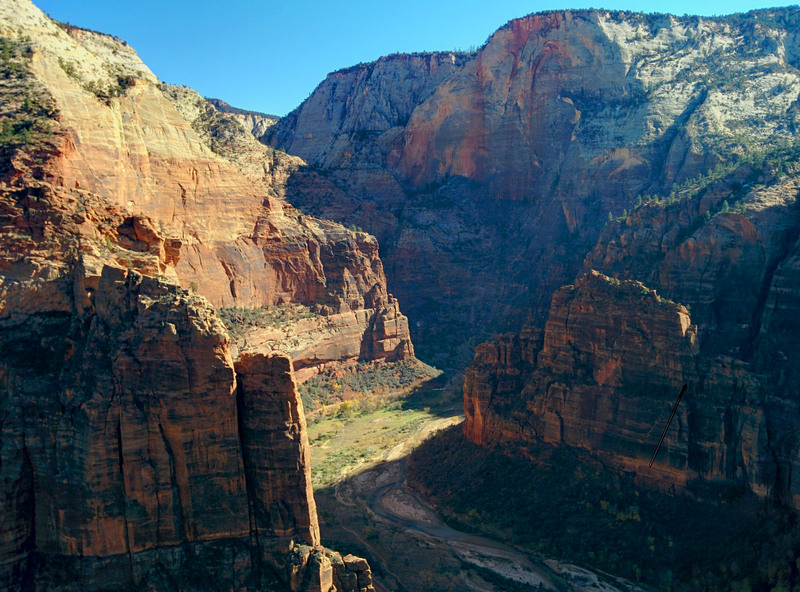 Scout’s Landing, Angel’s Landing Trail. Zion National Park. I was fortunate enough to be sponsored by the OPEC Fund for International Development to attend the One Young World Summit in Dublin, and hear how two inspiring gentlemen loyalist Jackie McDonald and republican Sean Murray, who fought on opposite sides during “the Troubles”, are now working towards reconciliation and sustained dialogue in Ireland. This could not be more up my alley. Turns out, there are a lot of us young people working towards the same goal in our respective countries, and we all got the chance to say a few words about what we’d learned during our special breakout session with Jackie, Sean, and others involved in the talks. Below is a clip describing what I found most inspiring. I blogged about the recent Culturunners Symposium over at ArchKiosk, the MIT Architecture student blog. My fabric “sculpture” bodyboundary was also on display during the event. You can read the full post here. Building Bridges is featured in the April issue of The Architect; the theme for the month is walls. It is guest-edited by Anoma Pieris, also a product of MIT’s SMArchS programme. I’m thrilled that she reached out to me, partly because BB is a project that is very dear to me, and partly because I am a fan of her work. Over the past year, she has been incredibly generous with her advice on navigating academia. You can pick up a copy of The Architect from the SLIA headquarters on Vidya Mawatha, Colombo 7. Today Shilpa and I embarked on an 8-hour journey along the Galle Road to get a sense of how businesses are affected by the loss of car traffic to the highway. We drank milk at Monis, ate rolls at Sinharaja bakery, drank thambili on the side of the road. We had a lot of chats with the managers of business large and small, from ones established in 1896 to one that opened two years ago, who generously made time for us and our questions. In short, yes, of course their businesses have lost a lot of customers because of the new highway, but their stories are much more nuanced and rich than that one-liner. Here are real people struggling to make ends meet, and each story is worth telling. They’re funny and sad and generous and hopeful and frustrated and hanging on by the skin of their teeth. I’m writing an article on some of these hidden costs of the highway for MIT’s CoLab, and just this one day’s worth of interviews made me realise that there’s a wealth of information that could potentially be very useful data for when the network of highways expands, especially to Kandy. I’m thinking maybe a summer project?